Since I posted the recipe for Aunt Alora's pie crust a few days ago, it was only right I post the apple pie recipe to go with it! I got this recipe from my dear friend Stephanie several years ago and have been making it ever since! Before you can start making the pie you need to peel and slice all the apples, but thanks to my awesome sister-in-law who gave me this apple peeler, the prep work was a cinch! 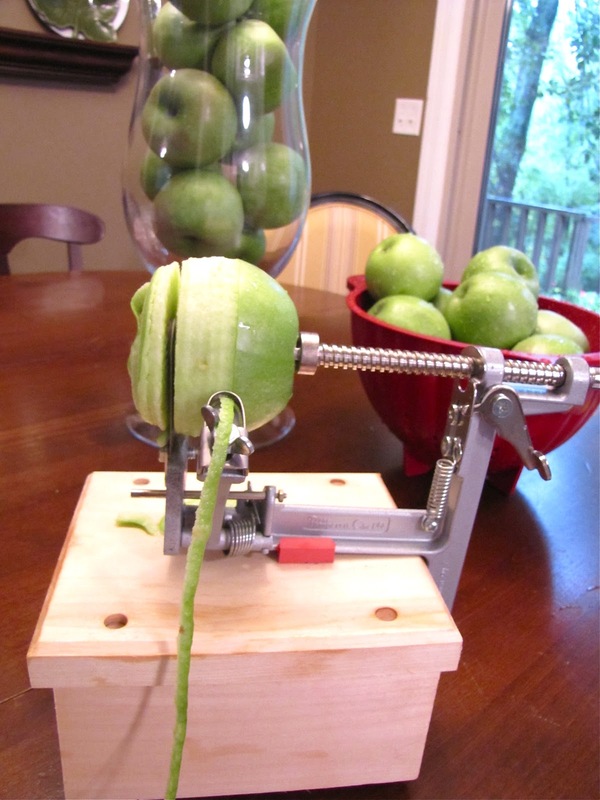 You place the apple on the peeler, turn the handle and it cores, peels and cuts the apple into what kind of looks like a slinky. Then you can break it apart into pieces or just chop down the middle with your knife and you're ready to make your pie filling. Fill your pie crust with this yummy mixture of apples, cinnamon and sugar and top with your crumb topping, Delish! Don't forget to sprinkle with chopped pecans and caramel! Prepare pastry for single crust pie. On a lightly floured surface roll out dough. Transfer to 9" pie plate. Trim. Crimp edge as desired. For crumb topping, stir together the brown sugar, 1/2 cup all purpose flour and the oats. Using a pastry blender cut in butter until the topping mixture resembles coarse crumbs. Set aside. In a large mixing bowl stir together the granulated sugar, 3 Tbsp flour, the cinnamon and the salt. Add apple slices and gently toss until coated. Transfer apple mixture to the pastry lined pie plate. Sprinkle crumb topping over apple mixture. To prevent over browning, cover edge of pie w/ foil. Bake in a 375 degree oven for 25 minutes. Remove foil. Bake for 25-30 minutes more or until top is golden. Remove from oven. Sprinkle pie with pecans, then drizzle with caramel topping. Cool on a wire rack. Makes 8 servings. You might also like this recipe for pumpkin pancakes! that pie looks so so awesome!!! she really had a fun day...can't believe shes 18! !